Introducing the revolution in Rowing with the Bodycraft VR100 Rower Rowing Machine. There are many Rowers in the marketplace but none provide the smooth feel of the Bodycraft VR100 Rower Rowing Machine. Rated highly by many users and Fitness experts gives this Rower the number one spot on our list for home and institutional use. With its high quality and smooth feeling, its no wonder why many customers are buying the Bodycraft VR100 Rower Rowing Machine over other top name Brands. Bodycraft VR100 Rowing Machine is a leading Rower in the fitness industry. High quality rowing simulator at an incredible price! 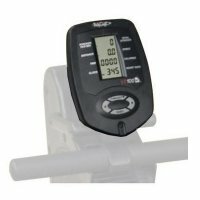 Adjustable (height and angle) Console has a built-in Polar (or compatible) Heart Rate Monitor receiver. Chest Strap optional. Console displays: Time Distance, Strokes, Calories and Heart Rate (with optional chest strap). Compact design. Folds for storage into a 16” X 24” space. Contoured ergonomic seat glides along precision bearing rollers. Sturdy frame ensures safe and efficient workouts. 44 inches of travel from pedals will accommodate any size user. Lightweight, rubber coated aluminum handle. Sealed urethane seat for increased durability. L68" x W17" x H22"
Maximum User Weight Capacity = 250 Lbs. Enjoy the feel of the open water on the BodyCraft VR100 Rowing Machine. The BodyCraft VR100 Rowing Machine mimics the smooth motion of rowing on the water with a contoured ergonomic seat glides along precision bearing rollers. 44 inches of travel from the pedals will accommodate any size user, no matter how small or tall you are. 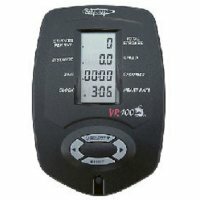 The VR100 offers one level of air resistance and five levels of air and magnetic resistance, letting you vary your workout intensity depending on your goals. 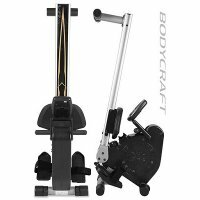 The BodyCraft VR100 Rowing Simulator features a compact design. It folds for easy storage into a 16 x 24 in space. Easy to Assemble and Easy to Store! The BodyCraft VR100 is constructed of Aircraft Grade Aluminum, and Steel. 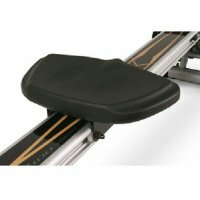 It has a contoured ergonomic seat that glides along precision-bearing rollers. It also features a lightweight, rubber-coated aluminum handle and a sealed urethane seat for increased durability. The Adjustable Console (height and angle) has a built-in Polar Heart Monitor receiver (or compatible). Chest Strap optional. The Console displays: Time Distance, Strokes, Calories and Heart Rate (with optional chest strap). Built to the highest quality specifications, the VR100 frame and all weld points are guaranteed for as long as you own the machine. All other parts are warranted for a period of one year from purchase date. 90 days labor. Monitor - Tracks time, distance, strokes, calories, and pulse. Compatible with optional heart rate monitor! Seat - Sealed urethane seat for increased durability. Travels 44 in. from pedals! Resistance Adjustment - Level 1 provides air resistance; levels 2-6 provide air and magnetic resistance. Adjust resistance with a manual knob just below the handle. Resistance Type - Level 1 provides air resistance; levels 2-6 provide air and magnetic resistance. Switch to silent magnetic helps keep noise level down! Storage - Compact, 68 in. frame that folds for easy storage. Bodycraft has a nice rowing machine in the VR 100. 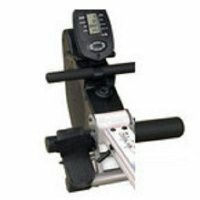 It combines both air and magnetic resistance for a unique rowing workout. Bodycraft is known for making durable, affordable home gyms, and they've taken that expertise and applied it to their vr100 rowing machine with fantastic results. 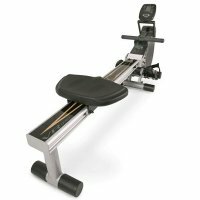 The resistance system on the vr100 is unlike any other rowing machine on the market. It combines wind resistance for level one, and magnetic resistance as the work load requirement increase. The rowing action on the vr100 is smooth and precise with no cord whiplash found on cheaper rowers, and the ergonomics are good for large and small users alike. The Bodycraft VR100 rowing machine is a compact yet sturdy piece of home fitness equipment. 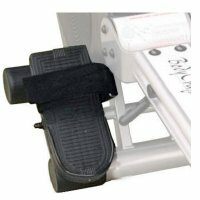 The 44 inches of travel space from the pedals means that this rowing machine should accommodate even the tallest users and the contoured seat is comfortable enough to keep you rowing during long workouts. Importantly, the operating motion is smooth and quiet. The VR100 offers 6 levels of resistance with level 1 offering air resistance and levels 2 to 6 offering air and magnetic resistance. The console displays important data such as time, distance traveled, number of strokes, calories burned and heart rate, although the heart monitor chest strap is an optional extra. The VR100 folds for easy storage when not in use, but the test of any piece of home fitness equipment is how motivated you'll be to regularly unfold it and use it to workout. The Bodycraft VR100 rowing machine is a high quality rowing machine, but since there are no preprogrammed workouts it is better suited to self-motivated exercisers.